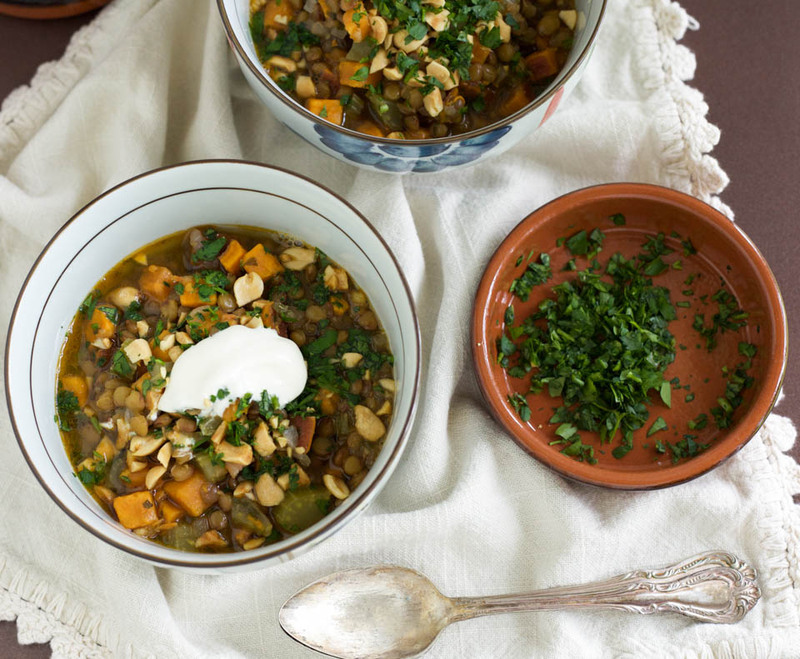 This Thai Peanut Sweet Potato Lentil Soup is beautiful, healthy, and super flavorful. It’s vegetarian, but can easily be made for vegans, dairy free, or add chicken for non-vegetarians. 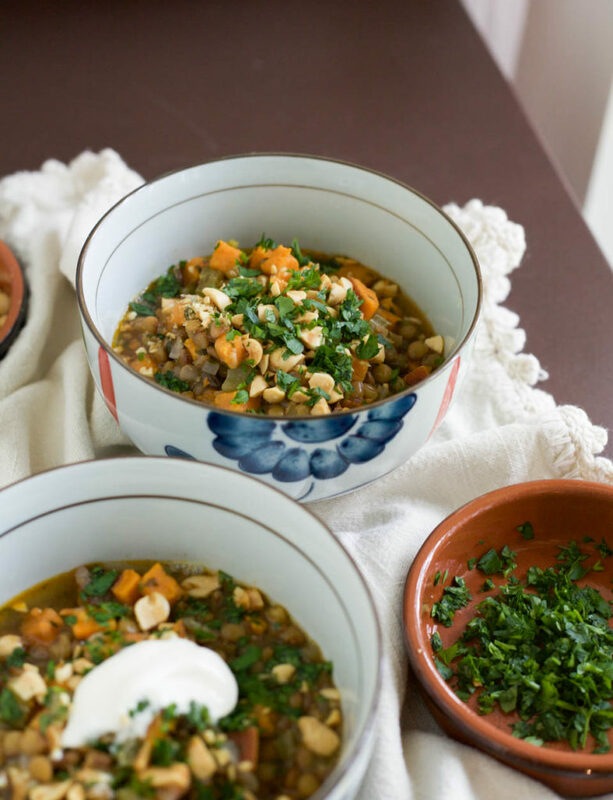 I love making soups for comforting, warming, and larger meals that are for dinner and lunch leftovers. It may be an easy and quick dinner to make, but isn’t that wonderful when you can get such a lovely and flavorful meal on the table for your family in less than an hour? The prep is ten minutes though, then it cooks away on the stove while you relax and talk with family about the day. Taking time to enjoy family is super important to me. Brian and I are close that way. We talk about our day while dinner is cooking or we’re getting ready to do yoga together. 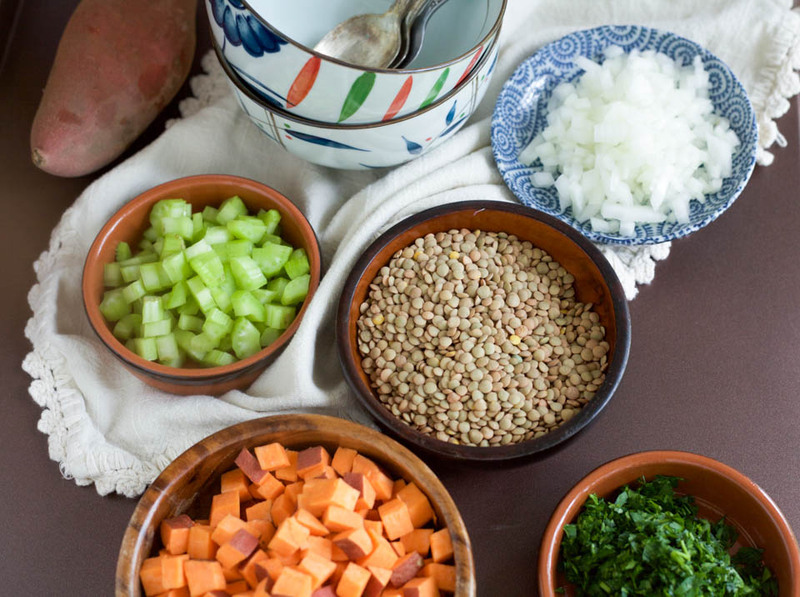 This Thai Peanut Sweet Potato Lentil Soup cooks on the stove, no need to do anything, so there’s plenty of time to do a nighttime relaxing twenty minutes yoga, which we love doing together. Or there is plenty of time to get in a load of laundry, help kids with homework or any other things that need attending to for 30 minutes or so. And it’s now getting to the rainy season in our area, so soups bubbling away on the stove is just perfect! 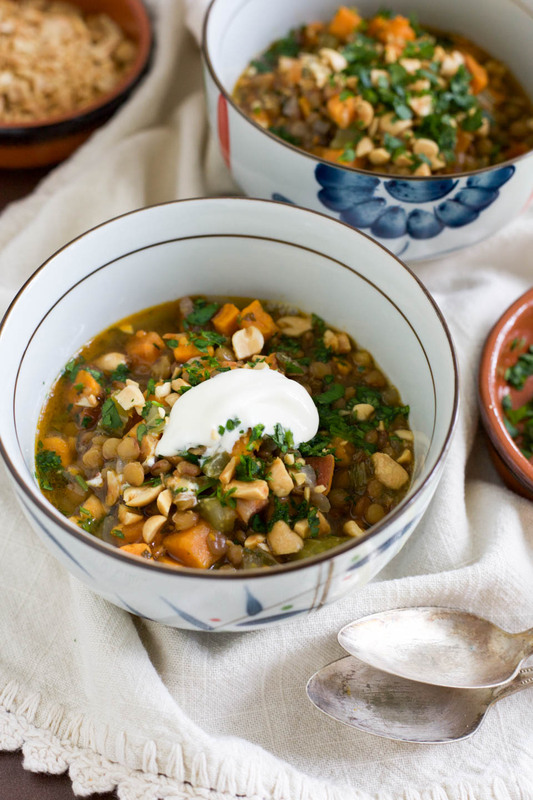 This beautiful, healthy, and super flavorful soup can be served with homemade flatbread for a comforting meal. You could also add chicken for a non-vegetarian/non-vegan meal. 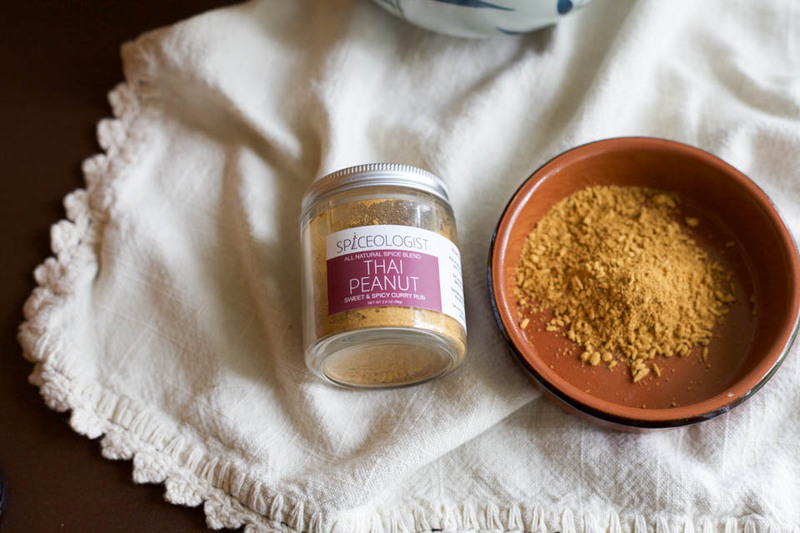 I love the Thai Peanut spice rub from my friend at Spiceologist which is found in many stores and easily ordered online. If you don’t have it on hand, use a red curry powder instead. But I highly recommend having this rub on hand for extra goodness! Add olive oil to a large dutch oven or large pot over medium low heat. Once oil is shimmering add onions and celery, stir then cook for 10 minutes. Add garlic and spice rub, cook for 30 seconds, until fragrant. 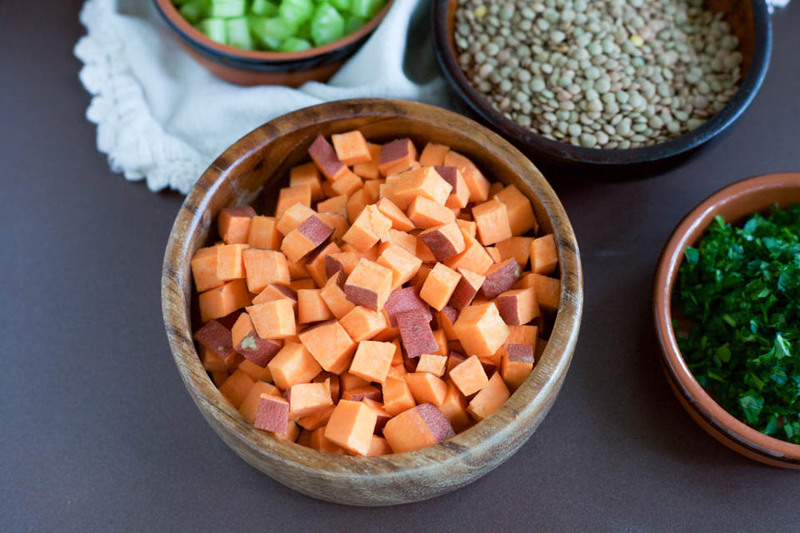 Add lentils, sweet potatoes, broth, and 1 teaspoon salt. Stir, turn up heat to high to bring to a boil, reduce heat to medium low and bring to a simmer, cover and cook for 30 minutes. Taste for seasoning, add salt if needed. Serve immediately with fresh chopped parsley or cilanrto, a dollop of sour cream or yogurt, and chopped peanuts. Store leftovers in an airtight container for up to 3 days. Four seasons’ favourite ! Thank you ! This is wonderful and very timely as I am observing #meatlessmondays. The peanut butter was a great addition. Will try this on Monday. Thank you for sharing. Delicious. As did not have Thai Peanut spice rub from Spiceologist added about 1/32cp chopped peanuts, 3 tbs creamy peanut butter to soup. Veggie tarian wife loved it though I’d not salted enough for her taste. Thanks. Such a great idea, Graham! I love that you added peanut butter. Thank you always for your feedback, making my recipes, and enjoying them with your lovely wife. You both are the best! I hope all is well.